Kosha Dillz @ The Grammy’s?? so I know its been a while since the grammys but you got to all know that i was totally pimping it out.. So while we are on tour (myself and Flex mahtews) I remembered I had some pictures with Robin Thicke when he was totally bombed out about not rocking with me at the Grammy’s. I said “listen bro, Im gonna let Lil Wayne shine right now and next time we roll out we’ll represent together. 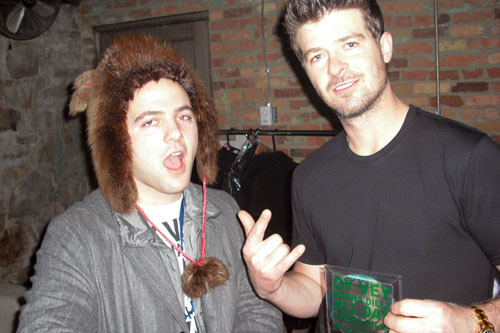 And here it is…Robin Thicke and Kosha Dillz. So yeah..